The history of the James Bond films is a fascinating one. Aside from being the story of the birth of a global cultural phenomenon, it is also a very human story, with the characters and personalities shaping the films, just as the films began to shape them. It is a story that has been told, at least in part, in film and in print for many years, but never before has such an authoritative work on the subject been published as "Some Kind of Hero". Perhaps the fist thing that strikes you with "Some Kind of Hero" is its size; at seven hundred plus pages this certainly makes it a hefty tome. However, this is not a book that's been written in a large point typeset and padded with pictures; unlike many hastily-prepared Bond books designed to cash in on the latest 007 outing, this book isn't merely an exercise in filler; every word on the page counts. A book of this size - and particularly a factual one - might be considered daunting to some, not just in terms of presenting a challenge, but also in its ability to keep one engaged. Can such a detailed exploration of the Bond films really sustain our interests until the end? The answer, satisfyingly, is yes. This is entirely due to the sheer wealth of knowledge on display here. "Some Kind of Hero" draws on the expertise and many years of experience of two intelligent and articulate authors who enjoy a well-earned reputation in the Bond fan community as absolute authorities on the subject. In a world that is populated by know-it-alls and braggarts, both Matthew Field and Ajay Chowdhury are very much the genuine article: Field was largely responsible for providing the background information for 2012's excellent Bond documentary, "Everything or Nothing", whilst Chowdhury is often the first person called when the BBC, ITV, or Channel 4 want to get an expert opinion on 007. Where these two writers differentiate themselves from other authors and fans is their refusal to be content with merely reiterating old stories until they become lore. Instead, for "Some Kind of Hero", they have quietly accumulated their information, unraveling half-truths that repetition has made fact, interviewing the people who were really there, and tracking down new narratives that have never been explored before. 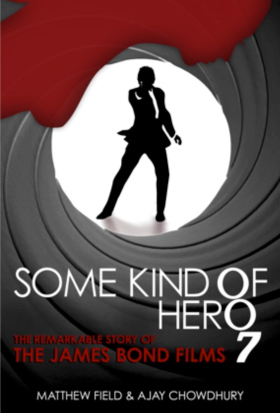 For the casual fan, or for those completely new to Bond, "Some Kind of Hero" presents an opportunity to really get to know the history of the films. For those that consider themselves experts, this book is almost guaranteed to reveal something new, whether it is merely an interesting anecdote or an entirely unknown piece of Bond history; for a subject that has been explored and discussed and written about endlessly, this is no mean feat. "Some Kind of Hero" tells the story chronologically, from the early fifties where Ian Fleming was already envisioning his hero as a cinematic proposition, to the run up to 2015's "SPECTRE". In between, we get an absolute goldmine of interviews, anecdotes, and insight. Both Field and Chowdhury conducted these interviews, undertook the historical research, and collated the information, however, the book at no point suffers from what can be a curse of co-authorship. Instead, you get the benefit of their combined knowledge, telling a story that, to them, must feel somewhat tired and familiar, but in a way that at no point seems patronising or dull. It's a difficult balance to strike when telling a story that some readers will be familiar with and others will have no knowledge of at all, but despite the occasionally extended plot précis, "Some Kind of Hero" never tips over the edge into either assumption or condescension and instead remains constantly engaging and informative. Seven hundred pages may seem like a lot but, in reality, the brilliance of "Some Kind of Hero" is in what isn't on the page. With a subject as broad and infinitely interesting as this, it would be so easy to digress down an anecdotal alley and find oneself lost in a maze of SPECTRE island proportions. It would be easy to write seven hundred pages on one Bond film alone, but instead the authors tell us just enough, keeping the story going, always aware that there are more films to cover. Talking of covers, it would be remiss not to point out the rather inventive design work of Mark Witherspoon, who has managed to incorporate the silhouette of a beautiful woman into the classic gunbarrel motif. The cover design is an important part of any book, and whilst one should never judge a book by its cover, it would not hurt to do so in this instance. Whilst by no means exhaustive (and honestly, what book on this subject could be? ), "Some Kind of Hero" is a very accomplished work. It will undoubtedly stand as an absolutely essential addition to any Bond fan's collection, and one that will no doubt become as indispensible as Kingsly Amis' "The James Bond Dossier", Raymond Benson's "The James Bond Bedside Companion", or the Fleming biographies by John Pearson and Andrew Lycett. For true Bond fans, or for those wishing to explore this fascinating story, Some Kind of Hero is an absolute must.